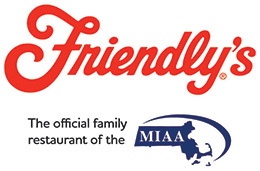 A Friendly’s FUNraising event for the Massachusetts Interscholastic Athletic Association (MIAA) is a great way to bring the community together! We’re proud to team up with the MIAA to support the mission of serving member schools and their students by providing leadership and support for the conduct of interscholastic athletics that will enrich the educational experience for all participants. The MIAA provides guidance, education and training to school administration, staff, coaches and students in a variety of areas including wellness, sportsmanship, coaches education, leadership and community service. Through this partnership, we’re excited to offer the MIAA/Friendly’s Fundraising Program in which participating schools can directly raise funds to support their own local organizations and programs directly benefitting their students and community. Stop by or call your local Friendly's and request a FUNraising event. Fill out the application form and provide a W-9 to book your event with your local restaurant General Manager. The General Manager will arrange for you to receive FUNraising vouchers, created specifically for your event. Distribute your FUNraising event vouchers and advertise your event with flyers! Be sure to include your organization’s name, as well as the date and time of your event. Don’t forget to invite your friends and family, too!